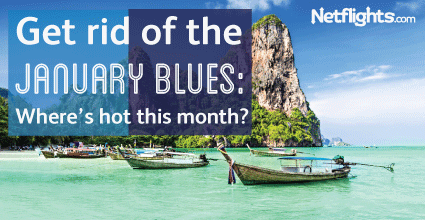 Get rid of your January Blues: Where is hot this month? January has a lot to answer for. This miserable month comes hot on the heels of the festive season, there’s no bank holiday on the horizon and there’s shorter days and low levels of sunshine. Your clothes are probably feeling uncomfortably tight, the next payday feels a long way away, and January 22nd is officially the worst day of the year. But there are ways to beat the January blues, and catching plenty of vitamin D-filled sunrays is your trump card. Bypass the January blues with a trip to one of these hot destinations. January is the hottest month of the year in Australia, with temperatures averaging 27°C in Sydney. Boost the vitamin D surge with an adrenaline-pumping climb over the iconic Sydney Harbour Bridge, to double your defences against the winter blues. The bridge’s summit is 134m above sea level so you’ll also be rewarded with panoramic views across Australia’s biggest city. See the harbour from another perspective at Quay, one of the finest restaurants in Sydney, and the world. Then help snap those winter-dulled synapses back in to shape with a dose of culture at the Sydney Opera House. Follow in the footsteps of Leonardo DiCaprio, Roger Moore, Pierce Brosnan and Bridget Jones to Thailand’s Andaman coast. You’ll find silky soft white sand, warm waters swimming with exotic fish and coral, and average daily maximum temperatures of 32°C. But to really knock the January blues on the head, join a meditation course, or one of the free meditation classes at Phuket Meditation Center; research indicates that meditation and mindfulness exercises help beat stress and change neural networks. January is actually Dubai’s coldest month, but that simply means temperatures are in keeping with a British summertime, making this a great time to check out both the emirate’s beaches, and its shiny shopping malls. In fact, January is the month of the Dubai Shopping Festival, which sees discounts of up to 75%. And if you find you miss the cold, you can always check out Ski Dubai, where real snow covers five runs of various lengths, heights and difficulties. After all, exercise is another prime weapon in the fight against the January blues. For a quick fix of vitamin D, jump on a short-haul flight to Tenerife, the largest and busiest of the Canary Islands. In January, there’s still a daily average of up to six hours of sunshine, and average daily maximum temperatures are over 20°C. The south of the island is generally hotter and drier than the north, but don’t miss Santa Cruz. The island’s capital buzzes with botanical gardens, art galleries and top-notch shopping and restaurants. In January, the average daily maximum temperature of this Caribbean island is a whopping 29°C. Fortunately, the trade winds make the temperature bearable, and the sea is positively balmy. Hit the beaches, stretch, snooze and soak up as much vitamin D as you can. If you’re more of an activity holiday type, the beaches on the east of the island are pounded by Atlantic waves, making it a surfer’s paradise. The gentle west coast is perfectly suited to jet skiing, kayaking, swimming and snorkelling.